There is a "real danger" more beds will be lost in community hospitals in north Wales because of staffing shortages, a watchdog has warned. The Community Health Council (CHC) for the Betsi Cadwaladr Health Board area made the warning after carrying out unannounced visits to the region's 14 community hospitals. Only 436 of 517 beds were available to be used. But the Welsh Government said the claims were misleading. CHCs are set to be abolished under Welsh Government proposals. Menna Llewellyn Williams from the CHC told S4C's O'r Senedd programme: "One of the main things we found was that there's a difference between the number of beds which exist and the number of beds in use". In some new hospitals beds have never been opened, she said. "We're concerned that we're finding beds are having to be closed because of a lack of nurses," she said. "You can't open a bed if you don't have a nurse to look after the patient so there's a danger there will be periods when beds have to be closed because there aren't enough nurses to look after them." As part of its survey the CHC also looked at cases of "bed-blocking" where a patient who is ready to leave the hospital cannot be released due to the lack of a suitable place for them to go. 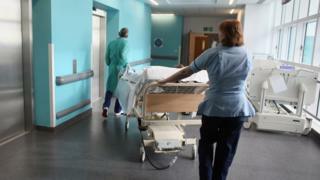 It was found that 66 beds in community hospitals across north Wales were occupied by people waiting to leave hospital. One patient at Chirk Hospital was found to have been waiting 145 days to be released. Plaid Cymru AM for North Wales, Llyr Gruffydd said the figures were a "huge concern". "Perhaps the research wasn't as scientific as some would like but it certainly gives us a snapshot of the situation at the coalface and it's clear the system isn't working as it should," he said. He said it was not acceptable for people to be waiting five months to be transferred from hospital to the community. A spokeswoman for the Betsi Cadwaladr Health Board said: "Delayed transfers of care can occur for a number of reasons, including patients awaiting specialist care home placements and patients waiting for care in their preferred location. "Our hospital sites and mental health teams work closely with community and social service partners to support the timely transfer of patients from hospital to a community setting close to home, appropriate residential or nursing care, or to support patients in their own homes." A spokeswoman for the Welsh government - which continues to run the Betsi Cadwaladr Health Board - said: "We do not recognise these figures. "The claims are also highly misleading. Betsi Cadwaladr has the highest number of people over 75 in Wales, which places a huge demand on services for patients with dementia and other age-related illnesses. "Despite this, as a result of record levels of investment in our NHS, delayed transfer of care performance at Betsi Cadwaladr is much improved. "The health board is continuing to work with local authorities to ensure patients do not have to stay in hospital any longer than necessary." Ministers said the health board was "actively recruiting" nurses, backed by a Wales-wide campaign, and the number being trained in north Wales was at its highest in ten years.